Boston, MA — Older people exposed to aircraft noise, especially at high levels, may face increased risk of being hospitalized for cardiovascular disease, according to a new study from Harvard School of Public Health (HSPH) and Boston University School of Public Health (BUSPH). Researchers found that, on average, zip codes with 10-decibel higher aircraft noise had a 3.5% higher cardiovascular hospital admission rate. It is the first major study to estimate the association between residential exposure to aircraft noise and cardiovascular hospitalizations, using data on the nationally representative U.S. population age 65 and older and noise data from airports across the country. 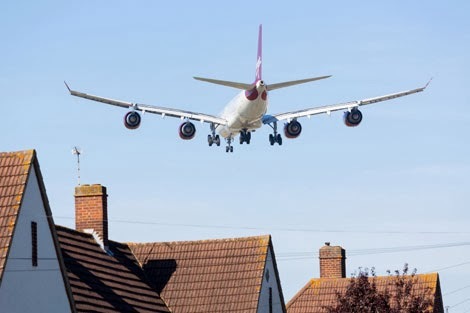 “It was surprising to find that living close to an airport, and therefore being exposed to aircraft noise, can adversely affect your cardiovascular health, even beyond exposure to air pollution and traffic noise,” said senior author Francesca Dominici, professor of biostatistics and associate dean of information technology at HSPH. The study and accompanying video appear online October 8, 2013 inBMJ (British Medical Journal). Cardiovascular diseases are the number one cause of death globally; in 2008, 17.3 million people died from cardiovascular diseases, representing 30% of all global deaths, according to the World Health Organization. The researchers analyzed the relationship between noise from 89 U.S. airports and cardiovascular-related hospitalizations among approximately 6 million study participants for 2009 using data from Medicare, the Federal Aviation Administration, the Environmental Protection Agency, and the U.S. Census. In their analysis, the researchers adjusted for the effects of socioeconomic status, demographic factors, air pollution, and roadway proximity. The results showed that the highest levels of aircraft noise had the strongest association with cardiovascular disease hospitalizations. Overall, 2.3% of hospitalizations for cardiovascular disease among older people living near airports were attributable to aircraft noise. In speculating about how aircraft noise might be linked to higher rates of cardiovascular hospitalizations among older people, the researchers noted that noise has been previously linked with stress reactions and increased blood pressure, both of which are risk factors for cardiovascular disease. “Our study emphasizes that interventions that reduce noise exposures could reduce cardiovascular risks among people living near airports. This can be done through improved aircraft technology and optimized flight paths, by using runways strategically to avoid when possible residential areas when people are sleeping, and by soundproofing of homes and other buildings,” said co-author Jonathan Levy, professor of environmental health at BUSPH and adjunct professor of environmental health at HSPH. The joint lead authors were Andrew Correia, quantitative analyst for Somerville, Mass.-based NMR Group, Inc., who at the time of the study was an HSPH doctoral student in biostatistics; and Junenette Peters, assistant professor of environmental health at BUSPH. Support for the study was provided by the U.S. Federal Aviation Administration as part of the Partnership for Air Transportation Noise and Emissions Reduction (PARTNER), a multi-university cooperative research organization with the primary objective to inform solutions for aviation-related noise and emissions problems. Visit the HSPH website for the latest news, press releases and multimedia offerings.